Luke reached for it at the exact same time as Jared. They scowled at each other. “Let me have it. I saw it first,” Luke insisted. “I do not,” said Luke emphatically. 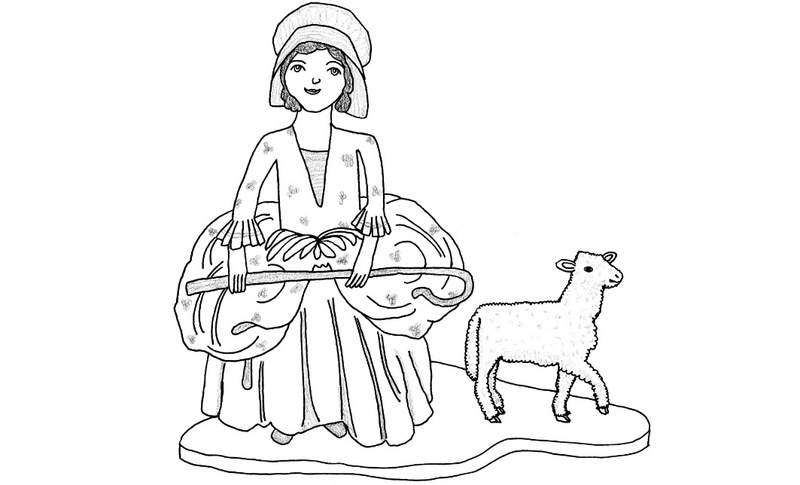 The item in question was a dainty ceramic ornament depicting Little Bo Peep with a lamb – an ideal Christmas gift for anyone’s mother. Dad took it off them and asked the lady how much it was. “All the small ornaments are 50p,” she told him. Dad looked at Jared and appealed to his better nature. “Okay,” he agreed and wandered off to the home-made jam stall. Luke pulled a sticky fifty pence piece out of his pocket and handed it to the lady. She wrapped the ornament in tissue paper for him. Dad smiled. “Where is Mum?” Luke asked. “Where d’you think?” said Dad, grinning. “Tombola!” they both said at the same time. This was the first time they’d been to the Maybury Christmas Fayre and it was pretty good. There were lots of stalls where you could buy Christmas presents for reasonable prices – some things were second hand, some were home-made. There were games, like Mum’s favourite, the Tombola, where you had to get a ticket ending in 5 or 0 to win a prize, and some which had a prize every time like the lucky dip or Luke’s favourite where you paid 50p for a jar wrapped in Christmas paper without knowing what was in it. If you were lucky it might be a jar full of sweets or marbles; if you were unlucky it might be full of tea bags. But even that wasn’t a complete loss because it could be a Christmas present for someone. Nan liked tea. There was also a cake stall, a raffle, and a dog show to see who was the prettiest dog and who was the cleverest dog and who was the most obedient dog. Luke knew that Dudley wouldn’t enjoy that because he was the type of dog who had no interest in performing. He was clever, but didn’t feel it necessary to prove that to anyone. He was his own dog and Luke respected that. The other good thing about the Christmas Fayre was that it was in aid of helping animals. Maybury Centre for Animal Welfare was a sanctuary where they looked after horses and donkeys and sheep and chickens and tortoises and anyone else who needed help and came their way. They also rescued dogs and cats and rabbits and guinea pigs who’d been abandoned or neglected or cruelly treated, and they found happy new homes for them. Luke was very glad that his Christmas shopping money was going to such a good cause. By three o’clock Luke had done all his shopping and was very happy with what he’d got for everyone: Little Bo-Peep for Mum; gloves for Dad; football book for Jared; jar of tea for Nan; bowling DVD for Grandad; and a jar of marbles for Joe. Plus he’d been lucky enough to score a jar of gobstoppers and a really cool stainless steel whistle for himself. Luke had 87p left so while Dad went to find Mum, he decided to have a final look round. In doing so he came across a man wearing climbing gear standing behind a table with a pen and a long list of names and numbers. “Sponsor me to abseil down the clock tower?” he solicited. The man tried again to explain. The man looked over Luke’s head at the elderly couple approaching his table. “Sponsor me to abseil down the clock tower?” he asked them. This entry was posted in Comics, Recommended Reading, Vegan, veggie kids and tagged animal sanctuary, Animals, children's book, children's story, christmas, juvenile fiction, vegan, vegan children, vegan children's book, vegan children's story, vegetarian, veggie kids. Bookmark the permalink.